Legalizing marijuana was going to stop the illegal marijuana trade and bring in revenue to Colorado. Right now, there is more black market marijuana on our streets than ever before, that’s according to the El Paso County Sheriff. And, more illegal marijuana grows translates into mounting costs for taxpayers. El Paso County will spend thousands tracking them down and then getting rid of the product. he Sheriff’s Office estimates they’ve seized roughly 5,200 marijuana plants since January 1 in the county. 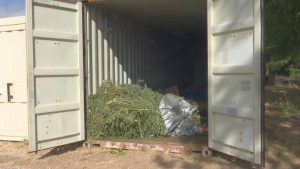 All of the seized plants and processed marijuana ends up in huge storage containers owned by EPSO. Once its there, the marijuana is dried out, shredded, and then turned into mulch. The El Paso County Sheriff’s Office says it costs law enforcement on both the front and back ends to find illegal marijuana and get rid of it. There is a cost on the front end to take down the grows, and then on the back end to destroy the product. Sheriff Bill Elder says criminals are taking advantage of loopholes in our laws, like the number of plants that can be legally grown. When medical marijuana was first legalized in Colorado, people were allowed to have 99 plants per location. People also had the option to pass them off and grow for up to 5 other people, so you could have up to 600 plants.